It is the immeasurable royal grace of His Majesty the King to vocational students that on 15 September 1988, His Majesty bestowed the name “Rajamangala Institute of Technology,” meaning “the technological institute of the royal grace.” This implies that the Rajamangala community including the university staff and students regards it as the royal grace of HM the King. From then on, Rajamangala Institute of Technology has been highly recognized as educational institution having a commitment on producing “hands-on graduates” to serve the society. Consequently, 15 September of each year is regarded as “Rajamangala Day,” on which Rajamangala staff and students recall the royal grace bestowing the name “Rajamagala Institute of Technology,” which is widely well-known and respected up to the present. Education values in Thai society are very different now to how they were in the past. Previously, vocational and technical education was seen as less important than the more traditional higher education paths. Vocational graduates were restricted to only receiving diplomas, and were not afforded the same level of status in Thai society as bachelor degree holders. This led to widespread discontentment among vocational students in various institutes, culminating in groups of vocational students protesting outside the Ministry of Education on 9 January 1974. They called for their institutes to be permitted to bestow bachelor degrees. The MOE consented, and the status of vocational and technical education in Thailand began to change for the better. to conduct vocational education at the diploma, undergraduate and higher vocational certificate level: to conduct research in technology and vocational education; and to provide academic services to the public. The Institute of Technology and Vocational Education Council appointed Professor Sawat Chaikuna, the Deputy Director of the Vocational Department, as Acting President of the college on 28 March 1976. He was subsequently appointed as permanent President of ITVE by Royal Decree on 12 June 1980. Although the college had conducted teaching and studying since 1975, its own buildings and facilities could not be constructed until 1984, due to complications and delays. Therefore, the college had to use seven different institutes of the Department of Vocational Education as faculties in order to conduct undergraduate education. The Faculty of Technology and Engineering was based in Vocational Teachers College, Thevet, the Faculty of Agriculture was in the Agriculture College, Bangpra, the Faculty of Business Administration was in Chakrabongse Bhuvanarth College, the Faculty of Home Economics was in the Vocational College, Phra Nakhontal, the Faculty of Fine Arts was in Pohchang Academy of Arts College, the Faculty of Music and Drama was in the College of Dramatic Arts, Fine Art Department, and the Faculty of Liberal Arts and the Faculty of Education were in Bangkok Technical College. ITVE was established with the aim of providing quality vocational education at a bachelor’s degree level. However, one of the main drawbacks was that ITVE faculties were all located in different regions across Thailand. Moreover, the Office of the President, as the center and coordinator of all the faculties, was only a small building limited in size by a lack of space at the Thevet campus. This hindered the effectiveness of learning and teaching. As ITVE had a responsibility to provide effective teaching and learning, it was crucial that there was an effective management system, especially when considering the importance of time and resource management. It was, therefore, necessary to establish a practical operational center so that the different faculties, spread across Thailand, could be properly brought together for the development and advancement of teaching and learning. 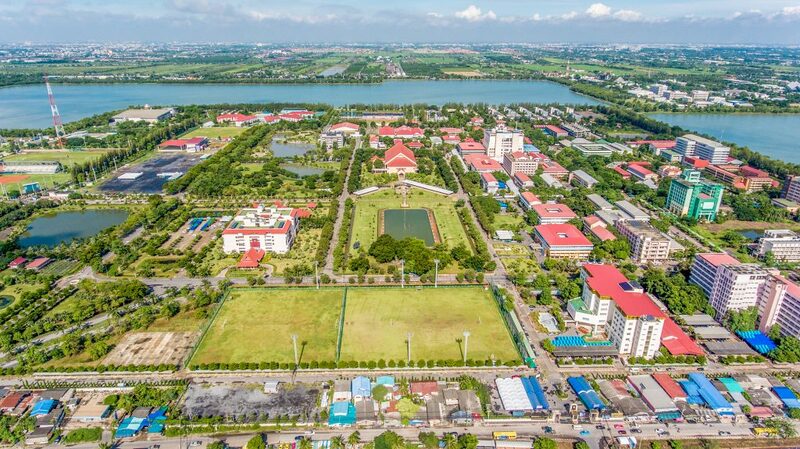 In 1984, during the presidency term of Professor Anan Krukaew, the second President of ITVE, the Department of Conservation Banking allocated land in Pathumthani to build up the ITVE Center. The size of this land was about 720 rai (a rai = 1,600 square meter) to the west of Klong 6, Amphoe Klong Luang, and about 110 rai to the north of Klong Rangsit. The process of building up a new institution in a remote area was not without problems, especially in the earlier stages, as local people had occupied much of the land and were using it for farming. Negotiations between ITVE representatives and local people took a year and a half before ITVE could actually start the process of construction in the fiscal year 1987. It should be noted that at the end of the negotiation process, a number of local people joined ITVE as permanent staff. In late 1987, the Institute of Technology and Vocational Education (ITVE) appealed to the Office of His Majesty’s Principal Private Secretary requesting for His Majesty the King’s kindness regarding the foundation stone laying ceremony for the ITVE Center. On Tuesday, 7 June 1988, at 16.09 Her Royal Highness Princess Maha Chakri Sirindhorn, as His Majesty the King’s representative, graciously laid the foundation stone of the ITVE Center. This brought good fortune and great joy to all the staff and students of ITVE. It was expected that the buildings and facilities would be ready by 1999, the year of the auspicious occasion of His Majesty the Kings sixtieth birthday. It was very gracious of His Majesty the King to personally award degrees to graduates of ITVE in the beginning. The main responsibility of RIT was to provide quality education in the field of practical sciences up to degree level. The work of RIT also covered research and development, the provision of social services, the nurturing of religions and culture, as well as preservation of the environment. The great advantage of Thailand’s National Education Act (1999) was that education providers at all levels were under the same responsible agent, namely the Ministry of Education. Institutions providing education at a degree’s level were under the care of the Office of the Higher Education Commission. More authority was also assigned to individual institutions in the form of national autonomous universities. Accordingly, RIT amended the RIT Act (1975) so that the structure of its administration and management would serve the National Education Act better. RMUTT is now a well-established comprehensive university, offering a diverse range of programs to serve a variety of leamers’ needs and interests, and has become a center for quality education. The official emblem of Rajamangala University of Technology Thanyaburi comprises the Lanja Korn (the royal emblem of King Rama IX), lying in the center encircled by eight ornate lotus petals. The petals symbolize the eight noble paths to enlightenment in Buddhism and the glory of wisdom spreading in all directions. The royal emblem of King Rama IX is used because His Majesty the King graciously bestowed the name “Rajamangala Institute of Technology” upon the university. At the top of the circle is Phra Maha Pichai Crown, and in the crown lies the Thai numeral 9, which signifies King Rama IX. 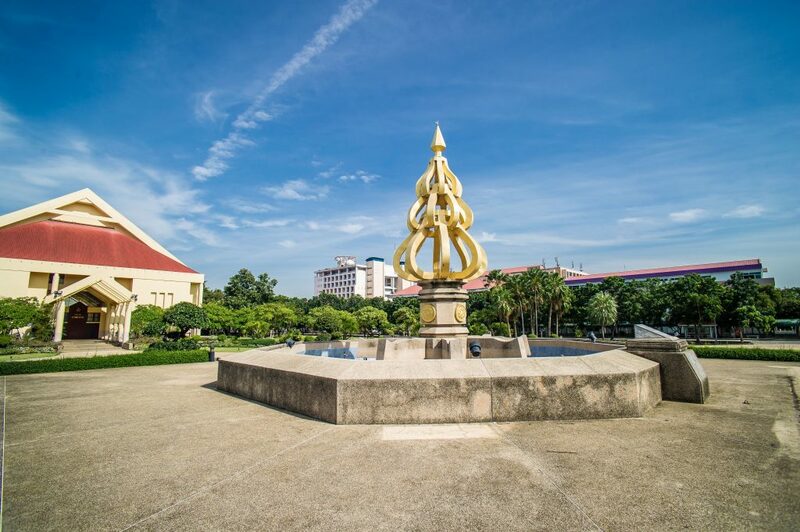 Under the circle lies a curved ornate banner bearing the name “Rajamangala University of Technology Thanyaburi.” At the end of both sides of the banner are holy flowers, which represent prosperity, spirit and congeniality. 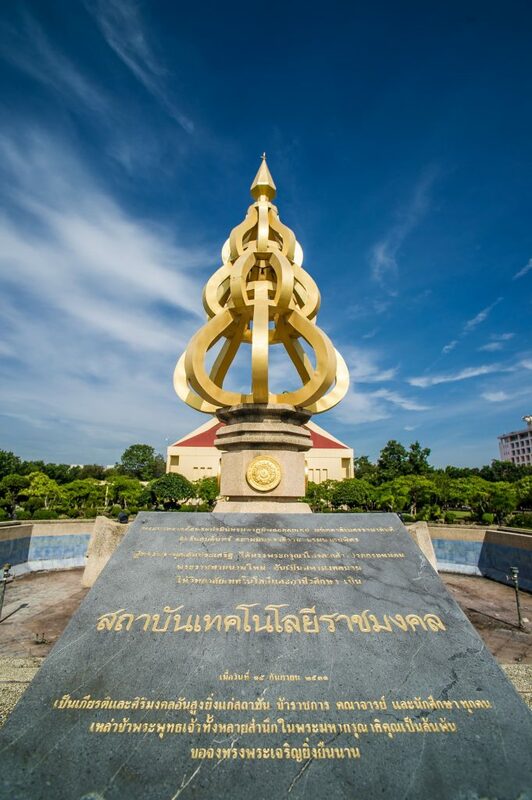 Engraved on the lotus-shaped bronze sculpture and stone, it states that Her Royal Highness Princess Maha Chakri Sirindhorn presided over the ceremony of laying the foundation stone and planting a Heaven Lotus tree on 7 June 1988. The Heaven Lotus tree is lovingly taken care of by RMUTT’s staff and students so that it can continue to grow and thrive, just as RMUTT does. His Majesty King Bhumibol Adulyadej officially appointed Her Royal Highness Princess Maha Chakri Sirindhom as his representative to preside over the foundation stone laying ceremony at the central campus of the Technology and Vocational Educational College (present-day RMUTT) at Tambon Klong 6. Klong Luang District, in Pathumthani. Thus, Tuesday, 8 June 1988, is a very auspicious date for RMUTT. Furthermore, HRH Princess Maha Chakri Sirindhorn planted the Heaven Lotus Tree at the sculpture platform (the lotus-shaped bronze platform). This has been an ongoing honor for RMUTT staff and students. To express gratitude to HRH Princess, RMUTT has designated the Heaven Lotus Tree as RMUTT’S special tree. His Majesty King Bhumibol Adulyadej presided over a graduation ceremony during which he handed out the degree certificates to the graduates of Technology and Vocational Education College (present day RMUTT) on 2931 July 1985, at Suan Amporn New Building. His Majesty graciously presiding over a graduation ceremony for students in the vocational field drew public attention to the importance of vocational education. Thus, the graduates were proud of their institute, and their education. This meant they could go forward into their future career with confidence and pride, and it is hoped it will ultimately lead to cooperation and unity amongst graduates in developing our country. This has been a huge source of pride for the RMUTT community. His Majesty the King, accompanied by HRH Princess Maha Chakri Sirindhorn, graciously presided over the graduation ceremony for the second time on 31 July and 1-2 August 1984, and for a third time, from 7-9 July 1987. After the Technology and Vocational College was renamed as the auspicious and royally bestowed “Rajamangala Institute of Technology.” His Majesty the King graciously presided over the graduation ceremony for a fourth time, from 19-21 July 1990. In 1991, Her Royal Highness Princess Maha Chakri Sirindhorn was officially appointed as His Majesty the King’s representative to confer degrees upon the graduates of RMIT.